With November coming to a close, winter is pretty much here. 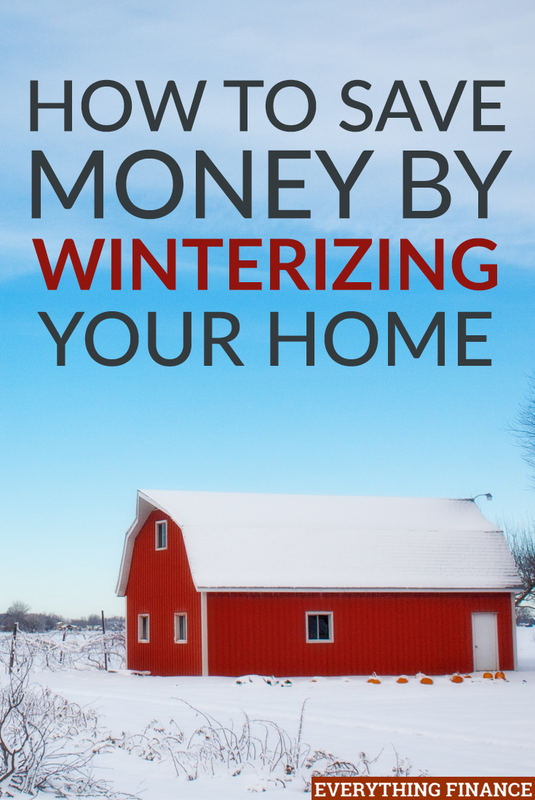 Although there are lots of things I love about winter, it doesn’t always love my home or budget. Sometimes, just the cost of staying warm and cozy can come at a steep price. Unfortunately, if you live someplace that dips below 30 degrees and can see ice and snow, you don’t really have a choice. Thankfully, there are ways to prepare your home for those bitter months which can save you money in the long run. Instead of paying a lot to keep your home toasty, consider putting these tips to use to successfully winterize your home and save money. The whole point of turning your heat on in the winter is to heat your home and not the outdoors. Unfortunately, if you have any leaks or drafts in your home, you’re most likely allowing warm air to seep out. Anytime this happens, your system has to work overtime to replenish the warm air that’s escaped, which could cost you a lot of money. Thankfully, there are lots of ways to winterize your home through both easy and more complex fixes. One way to fix simple leaks is by using weatherstripping and caulking. Test areas around your home such as doors, windows, electrical fixtures and boxes, and any other spot air could leak out, by taking a lit incense stick and carefully placing it near those areas to see where the flame wavers. Any spot where it does indicates a leak that should be caulked or weatherstripped, depending on the area. Another quick fix is to buy or make a draft snake, which can be anything from a rolled-up towel to fabric filled with sand, to keep cold air from coming in from the bottom or your doors. If you want to do something a little more complicated, you may want to consider sealing your ducts as well. Like most of the important systems or appliances in your home, your heating system should be checked and cleaned annually. Have a professional come and examine your system at least once a year to ensure that everything is working properly and efficiently. Furthermore, go around and check all your heating vents. Make sure they’re all unblocked and open so air is evenly spread throughout your home. Another important step to checking your heating system is cleaning or replacing your furnace filters. Dirty filters are not only harmful to your air supply, but can also increase the energy demanded of your furnace and restrict airflow. Overall, dirty filters simply become less effective. While it may not always be at the top of your list, during the cold season, keeping on top of your furnace filters can be an easy way to save money on your energy bill and increase your filters longevity. It’s no mystery that once temperatures dip below 30 degrees, water tends to freeze. Your air conditioner pipes and hoses use water that can freeze in the winter. Make sure you turn your A/C’s water off if it has a valve. Furthermore, check your outdoor spigots and hoses and turn your exterior water off as well. Not only will you save your pipes, but you’ll save money now and in the summer, too. Apart from fixing drafts and leaks, another great way to winterize your home, minimize drafts, and reduce airflow is by installing storm doors and windows. While this may seem like a bit of a pain in the moment, storm windows, at least energy star-certified models, can make all the difference when the weather turns bitter. However, if storm doors and windows seem too expensive, another great option is a window insulation kit. Insulating your windows essentially consists of putting a plastic over your windows that acts as a buffer to cold air and drafts, helping your home hold heat. Once installed, the plastic should be invisible, leaving you with a cheap and easy way to keep your home warm. This may seem like an odd suggestion, but you’d be surprised what switching the directions of you fans can do. Most homeowners don’t think of turning their ceiling fan on unless they’re hot, however, if your ceiling fan allows you to switch its direction, it can help you when you’re cold as well. Fans tend to run counterclockwise in their rotation, but by changing your fan to circulate clockwise, you’ll find that it can produce warmer air, too. By using your fan to create warm air, your heating system can work a little less and therefore save you money on your next bill. The idea behind insulation is to keep heat from escaping your home during winter, which is why insulation can make all the difference when you’re trying to save money. Before snow and bitter winds hit, take the time to examine the insulation throughout your home. Depending on when your home was built, you may want to consider adding more insulation between your walls, as older homes tend to have less, and add or install insulation to your basement ceiling or attic floor. While you can do this yourself, depending on the bulk of the project, this may be one move you’ll want professionally done. Still, you’ll save more in the long run by ensuring the heat stays packed in. As the temperatures start to drop, it’s important to ensure that your home is well-sealed and protected from the cold. While small inefficiencies, such as leaks and drafts, may not seem like a big deal, you’d be surprised how much they can affect your energy bill. Take a moment before fall comes to an end to fully examine and winterize your home. Consider each of these fixes and find all the ways you can more effectively hold in the heat. When it’s blistering outside, you and your wallet will be glad you did. Have you tried any of these home fixes? What have you done to winterize your home? We are fortunate that husband is an engineer specializing in heating systems. So we have done quite some work, from new modern windows to fixing any issues that might cause our apartment to ‘leak’ heat. We also have a thermostat on our heating system, which means it will keep the temperature we set and it’s easily programmable.